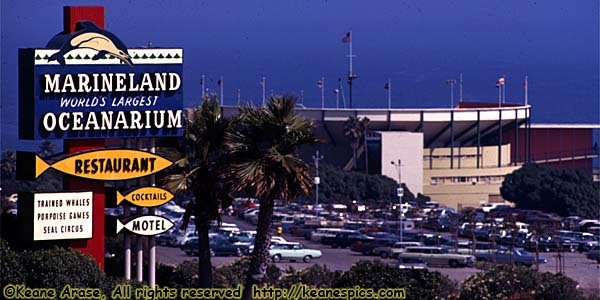 Marineland of the Pacific actually opened a year before Disneyland in 1954, in Palos Verdes, very near Los Angeles. In 1986, Harcourt Brace Jovanovich (yes, the publishing company) who owned the Seaworld ocean parks (yes, they really were a publishing company,) purchased Marineland, moved the Killer Whales to the Seaworld in San Diego, and promptly closed Marineland. One of the Killer Whales (Corky II) became one of the Shamus. I was there in 1969, along with a trip to Disneyland and as much as I remember of the trip, Disneyland wins. (Hey, it was only 40 years ago...) Perhaps that's because one of the local zoos in Chicago, Brookfield Zoo, had a dolphin show. Or maybe it was because I was more infatuated with Disneyland than an oceanarium. Now, the only reason I bring up Disneyland is because I came across these pictures (actually transparencies) while looking for those Disneyland pictures. And since many consider Marineland California's first theme park, here it is. If Marineland sounds vaguely familiar, it might be because they filmed a few movies here, among them Pirates of the Carribean. There are a few other Marinelands throughout the world, but none seem to have a connection to this one.